How do cats find the weirdest places to sleep? So the boring diet and the futile attempts at exercise continue. Over the years I have slowly come round to the idea that it might be prudent to look after my self. After all, I don’t have a spare body. So this has seen a departure from fizzy drinks. Swapping sugar for sweetener. And purely on a financially motivated footing, stopped smoking. Although to be fair I’m lieing to myself. I’m just telling myself I’m conducting an experiment to see how long I can go with out a smoke. Up to nearly two years now. But there is a draw back to all of this. And as my tongue is not being subjected to a barrage of chemicals, I have found that food tastes awesome. Which led to 4 extra stone. Not great for those feeling of self esteem. Hence the boring diets. But we all know the equation. Burn more energy that you take in = eventual weight loss. Take in more than you gain = plus size clothing shopping and an aversion to mirrors. So in my case I peaked at 17 and a bit stone. Now I don’t have a target weight in mind. The jumped up white tea tray of the Wii fit board did recon that I should be 11 and a half stone. Screw that! The only time I was near that weight in my adult life was when I was very ill. So I’ll settle for being able to see my toes without having to bend forward and breath in. This has led me to walking places instead of driving. Taking stairs when it’s practical. Being mindful of what I eat. So being hungry and out in the field, don’t get a chocolate bar. Avoid the fast food burger chains. We all know the gig. But it’s dull as hell. But time passes and things get a little more easy. And then I started using a cross trainer 3 times a week for a 10 minuet session at a time. Doesn’t seem like much, but it’s beginning to add up. Now a couple of months ago I met up with my friend up north, and she suggested that we go swimming. Now I hadn’t been swimming in years. At least 10, possibly longer. But I agreed to it. And it was a lot of fun. Ok a little embarrassing in that my friend still smokes roll ups and has better lung capacity and endurance than I do. And I’m the one that’s supposed to be getting healthy. But that aside, I felt good afterwards. So I figured swimming would be something that I could continue to do back home. So after a good Google search or two, several local swimming pools were located. So I chose the nearest one. It’s at a local school. So a little odd as everything is on kiddie scale. And there is no lockers there. So trying to stuff everything into a small bag was a challenge. And it was a nice enough pool. Ok, I wasn’t expecting it only to be 3 foot deep in the shallow end. So getting in and still being bone dry above the waist was unexpected. But quite a few ungraceful lengths later of sort of breast stroke, I figured I was exhausted enough. So after showering and getting changed I headed back to the car. Form out of the shadows trotted a tiny kitty. It looked at me and went “Meep!”. So I crouched down and said hello. This was a mistake. As the kitty bounded over. Climbed up my leg and then my front and proceeded to sent every last part of my head. Affectionate little bugger 🙂 So after a while it used it’s Jedi powers of cuteness and ended up curled up in my arms. It didn’t seem bothered when I straightened up and started walking to the car. It didn’t even mind as I got in. Not going anywhere? 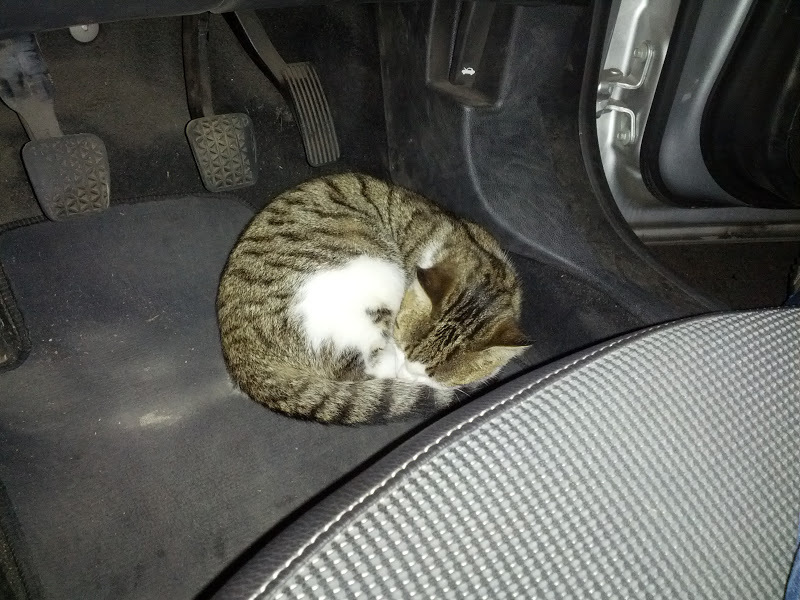 Why not let a random cat sleep in you car? In fact it decided that the foot well would be an ideal place to take a nap. Now this was going to make driving a bit of a challenge. So after a while I thought “I know, I’ll start the engine. That’ll make it get out”. Nope. Barely stirred. In fact as the heater now started blowing It just became more fluffy. And being a complete softy when it comes to cats, I was battling with the thought processes involved in disturbing it but picking it up vs cat-napping it and taking it home. Thankfully there were a group of ladies in the car park. 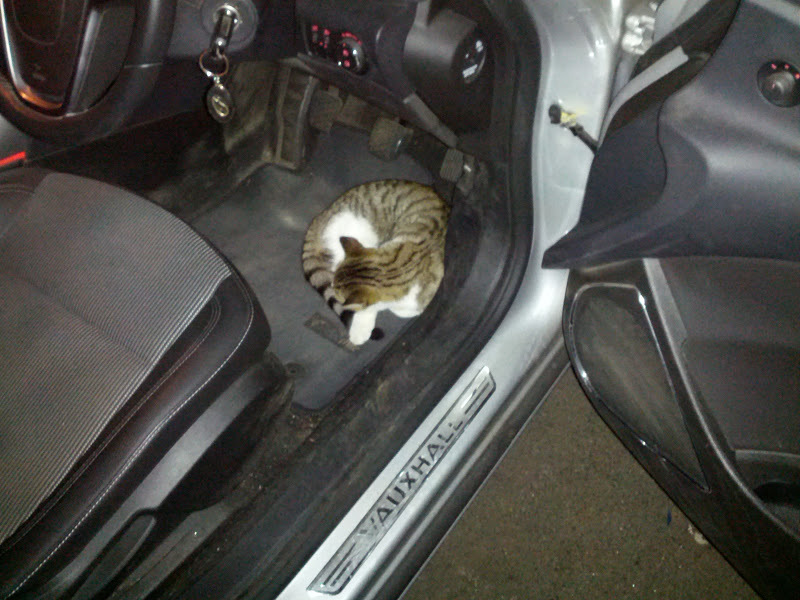 So I reluctantly picked up the sleeping cat, and gently set it down in the car park. It gave me a very confused look. But moments later it spotted the group of ladies on the other side of the car park. So it trotted over. Rubbed up against the first leg it found. Sat in the middle of them. Went “Meep”. And was promptly picked up and cuddled 7 seconds later.